Dupioni can make the most of having her sights lowered on her return to Kempton. Rae Guest’s filly caused a minor upset when making a winning debut at the Sunbury venue in early October and while the form is nothing to write home about, her performance was taking enough for connections to pitch her in at Listed level in the Bosra Sham at Newmarket a few weeks ago. The bare form suggests she had her limitations exposed on the Rowley Mile as she finished last of seven runners, but that does certainly not tell the whole story. Dupioni played up in the starting stalls and after being waited with in the early stages, she was hampered on a couple of occasions when aiming to make inroads on the leaders. She did not beat a rival home, but was only beaten seven lengths and would have been closer had she enjoyed a clear passage. Dropping in class for division one of the 100% Profit Boost At 32Redsport.com Fillies’ Novice Stakes, she should prove hard to beat. Padura Brave is fancied to complete a course hat-trick in the 32Red Casino Nursery. Having shown glimpses of promise on turf, the Mark Usher-trained juvenile opened her account over seven furlongs here in September, with the application of cheekpieces having the desired effect. A 7lb rise was not enough to stop her following up when she tackled a mile for the first time a month ago and a further 4lb hike does not look insurmountable for a filly who is clearly in good heart. Thomas Darby can further enhance his reputation by maintaining his unbeaten record at Ascot. The five-year-old justified market confidence when making an impressive racecourse debut in a Huntingdon bumper in the spring. Fledgling trainer Olly Murphy has made no secret of the regard in which he is held and the fact he made his seasonal reappearance and hurdling debut at Cheltenham last month tells its own story. It his testament to Thomas Darby’s latent ability that despite running green and hanging right racing up the famous hill, he still passed the post comfortably clear of his rivals. That form received a massive boost when runner-up Elixir De Nutz returned to Cheltenham to win the Grade Two Supreme Trial last weekend, suggesting Thomas Darby has what it takes to climb to the top of the novice ranks. The David Brownlow Charitable Foundation “Introductory” Hurdle looks the perfect stepping stone for Murphy’s exciting youngster. Wenyerreadyfreddie can register a second successive win at the track in the Tindle Newspapers Novices’ Chase. Nicky Henderson’s inmate was a decent hurdler without being a top-notcher. He made his fencing debut at Kempton on Boxing Day of last year, but was pulled up and did not run again until finishing second at Aintree in May. His second effort over fences on his return to action at Uttoxeter last month was most encouraging, as he pushed the admirable Lil Rockerfeller close, and it was no surprise to see Wenyerreadyfreddie go one better when switched to handicap company here three weeks ago. However, it was still hard not to be impressed by the manner of his 18-length demolition job and he will be hard to beat as he bids to follow up. Jumping resumes at Catterick for the first time this season. Ruth Jefferson’s Return Ticket won a bumper here last December and after a dominant recent win over hurdles at Musselburgh, he is fancied to make a successful start to his career over fences in the Come Racing New Year’s Day Beginners’ Chase. Emitom, an impressive winner of an Ascot bumper at the start of the month, rates the best bet at Ffos Las in the Sigma 3 Kitchens Ltd Maiden Hurdle. ASCOT: 1.00 Wenyerreadyfreddie, 1.30 Champagne Platinum, 2.05 Thomas Darby, 2.40 Cobra De Mai, 3.15 Royal Village, 3.50 Scheu Time. CATTERICK: 12.15 The Very Thing, 12.45 Grow Nasa Grow, 1.20 Valkenburg, 1.50 Cloth Cap, 2.25 Our Reward, 3.00 Return Ticket, 3.35 Court Jurado. DUNDALK: 6.00 Miss Florence, 6.30 Too Precious, 7.00 California Lad, 7.30 Karasi, 8.00 Ishigati, 8.30 Geological, 9.00 Anfaass. 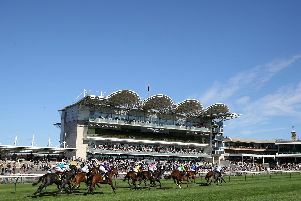 FFOS LAS: 12.35 Corner Creek, 1.10 Kings Inn, 1.40 Emitom, 2.15 Bang Bang Rosie, 2.50 Virginia Chick, 3.25 Golden Sovereign. KEMPTON: 5.15 Merchant Of Venice, 5.45 DUPIONI (NAP), 6.15 Al Messila, 6.45 Uncle Jerry, 7.15 Padura Brave, 7.45 Blazed, 8.15 Perfect Refuge, 8.45 Point In Time.